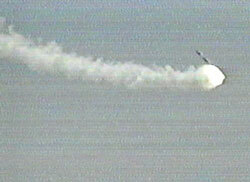 Video shot during Saturday's doomed launch of a Pegasus booster with NASA's X-43A experimental aircraft shows what might be one of the rocket's aerosurfaces breaking off moments before the vehicle goes into an uncontrolled tumble through the sky. The air-launched Pegasus was carried 24,000 feet above the Pacific Ocean, several hundred miles off the Southern California coastline, by NASA's B-52 aircraft where the 41,400-pound vehicle was released at about 4:43:31 p.m. EDT (2043:31 GMT). 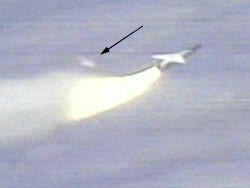 After falling for five seconds as planned, the Pegasus ignited to propel the X-43A to an altitude of 95,000 where the craft would separate and begin its tests of a revolutionary scramjet engine. The rocket booster is a modified version used by the Orbital Sciences Pegasus launcher that lofts small satellite cargos into space. For a typical space launch, the Pegasus features three stages and a protective fairing to enclose the payload. For the X-43A launch, however, only the solid-fueled first stage was used. The stage is comprised of an Alliant TechSystems-built Orion 50S motor, a delta wing and three electromechanically-guided fins used for steering during flight. And in order to carry the X-43A, an adapter is mounted to the front of the Pegasus booster. The stage was modified to include a new thermal protection system designed to protect the Pegasus' composite structures against severe heating loads experienced in lower-altitude hypersonic flight. The rocket also featured an upgraded first stage guidance system and an avionics repackaging. The flight plan called for the Pegasus to fly straight for about three seconds after ignition before pulling up to begin climbing in altitude. 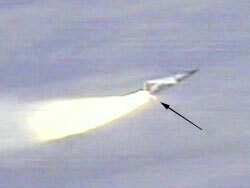 Mach 1 would be achieved seven seconds after ignition. In video NASA released on Monday taken by an F-18 chase aircraft indicates the rocket followed its prescribed track and began pitching upward as expected. 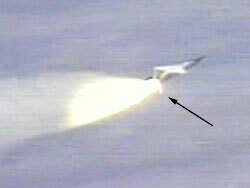 But disaster struck approximately eight seconds into powered flight when a piece of the rocket's back end breaks off. NASA is calling this point in the launch a "major malfunction." 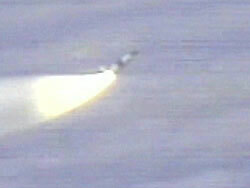 Close examination of the video suggests that the piece is one of the fins -- the aerosurfaces needed to steer the vehicle. What remains unknown is whether such a break would be caused by a problem with the Pegasus, or if aerodynamic loads exceeded what the rocket could handle. Further, it remains unclear if the object tearing off the vehicle was a cause or effect of the failure. As the piece falls away, the vehicle immediately rolls to the left and then violently yaws to the left (to the south from its westward trajectory). More pieces of the rocket then begin to rip away as the booster tries to correct and yaws back to the right. The recovery is hopeless and the vehicle begins to wildly gyrate. 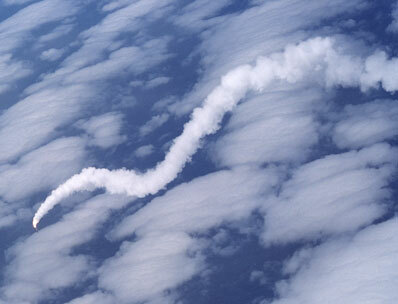 NASA officials then made the call to destroy the rocket by sending a command to fire onboard self-destruct explosives. The debris fell harmlessly into the Pacific with no plans to retrieve the wreckage. Former astronaut Vance Brand, currently deputy director of Aerospace Projects at NASA's Dryden Flight Research Center where the launch originated, is leading the agency's Interim Incident Investigation Team. The group is responsible for gathering and impounding data that will be turned over to the Mishap Investigation Team -- when named later this week -- for determining the cause of the failure. Lost in the failure was the first of three X-43 aircraft as part of NASA's $185 million Hyper X program aimed at testing a supersonic combustion engine, called the scramjet. Unlike a rocket that must carry its own oxygen for combustion, the scramjet is an air-breathing engine that scoops oxygen from the atmosphere. Without the need to carry oxygen, a vehicle powered by such an engine can carry more payload. NASA is developing the new engine for possible use on next-generation aircraft and reusable space launch vehicles. NASA had planned to fly the next X-43 mission in six months, but whether it will be delayed is not yet known.